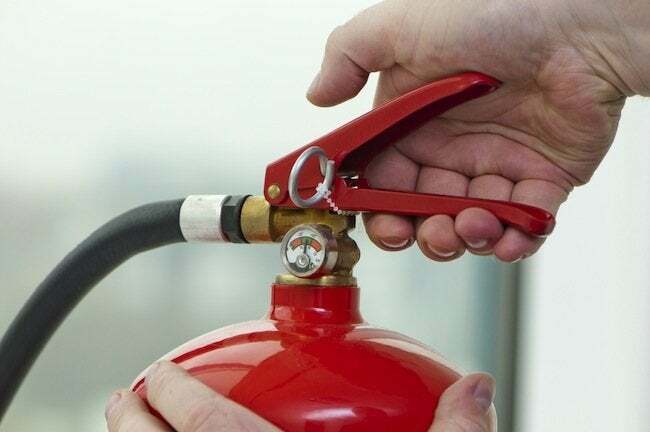 Did you know there are times when using a fire extinguisher can actually make matters worse? You probably wouldn’t think of living in a home without smoke detectors—they are proven lifesavers. But what about fire extinguishers? Is it smart to have one in your home? And in the event of a fire, does it make sense to use it? The answer is not so clear-cut. It’s true that a fire extinguisher, if it’s the right type and properly used, can keep a small fire from turning into a larger one. But although it makes sense to put out a fire in a wastebasket before it spreads to consume an entire home, using the wrong type of extinguisher, or not using it correctly, can actually make matters worse. The Federal Emergency Management Agency has guidelines for when to use a fire extinguisher. First, pick up your extinguisher only after the fire department has been called and all other occupants alerted. And try to use it only on a fire that is contained in a single place, such as a wastebasket. Second, identify your means of escape before you use a fire extinguisher, and don’t use it if the fire is between you and that escape route. Finally, don’t use an extinguisher if you are breathing in smoke, or if your gut instinct tells you that the situation is not safe. When in doubt, get out.